Anirban is the youngest son and disciple of Pt. Buddhadev Dasgupta. Needless to mention, he grew up with the very best ambience of Indian Classical music, with his older sibling, Bhavani Shankar also following his father’s footsteps. 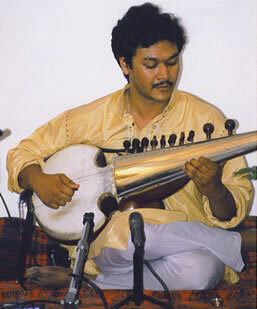 Not to be left behind, Anirban also took to playing the Sarod from an early age under the able guidance and tutelage of his illustrious father. A wonderful product of innate talent, years of grueling toil and delicate musical nurture, Anirban remains an extremely humble and self-effacing artist. In 1987, he stood first in the All India Radio Music Competition. He has performed widely in India as well as in the UK, Netherlands, Germany, Belgium and USA. He released his first CD album in 2002 from the Netherlands. Anirban has followed his father’s footsteps in balancing a dynamic musical career with commendable academic and professional pursuits. He holds a Masters degree in Electrical Engineering from Jadavpur University, Calcutta and is employed as a senior IT executive in New Jersey, USA where he presently lives.